Some perfume lovers have synaesthesia, wherein they experience scents as colors, music, numbers. I have a lesser-known neurological condition known as sweaterthesia. I smell a fragrances and immediately visualize a sweater. Sensuous Noir. The wooly perfume with modified dolman sleeves and a blouson silhouette. Nerdily Midwesternly enough of me, I kind of like the good-natured goofiness of this thing. Or at least that's the impression you've given me. Which perfume would be a "Grandma Loves Bingo" sweatshirt? Ouch. Too funny though. When I saw in the news not long ago that Elizabeth Taylor's estate made $77M in 2010 alone, most it from White Diamonds, I thought maybe the stuff might be worth checking out. "Grandma Loves Bingo" gave me a chuckle. I love Liz, so I mean no disrespect by my funnin'. Oh boy it sounds like fun! Maybe too much fun for me but most definitely going to sniff this at the E.L. counter and then count the reindeer and glitter snowflakes as they descend on the center isle of Macy*s. Your reviews are always so much fun. That is what its about with perfume ...the fun of it. I like your neurological condition (please include some more in the future). :). I'll see what other disorders I can muster. PS: Where did you find those sweaters?? 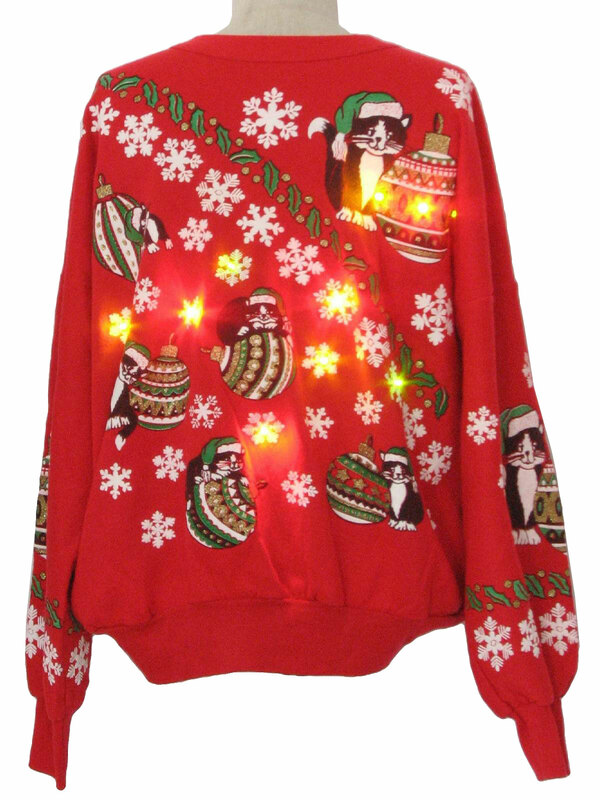 I want the one with lights. Oh wait, they both have lights. I prefer the black one. It's glowier. Ooops! Sorry! Only after your reply did I realize my comment didn't sound the way I wanted it to. I'm with Ines. HILARIOUS!! I needs to get me both the frag and the batwings. Portia, minus the cats and the electricity, I kind of like that red sweater! Love your reviews. i really liked Sensuous by Estee Lauder and actually bought a small bottle but I didn't care for the Noir version at all. Sensuous is my preference from that branch of the family tree. Anne, I'm wearing Laura Mercier Deco Rouge lipstick with a bit of NARS Holly Woodlawn gloss on top. Both are tomato-y reds, so it's odd that my lips look fuschia in the video. But a wonderful fuchsia lipstick I'm loving lately is one from YSL's new Rouge Volupte Shine line called Fuchsia in Excess (5). Thanks for the fun review, I always had a soft spot for this one! Hysterical. That is one ugly, gaudy perfume. 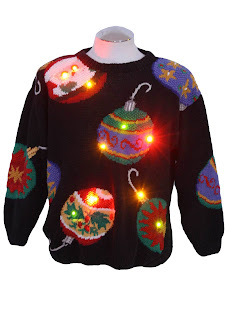 Now I have a jumper rather like those - sans the illuminations unfortunately - perhaps that's why I'm drawn to the 'holiday perfume'. Though I'm not over-the-moon with Opium, I do like Estee's own take on that tale in the shape of Cinnabar, so maybe this one's for me too. On the topic of festive fragrances, the greatest for me has to be Caron's Nuit de Noel - which seems to promise the most macabre and crazily surreal of Christmases ever. A smell for a macabre Christmas is probably extremely versatile, considering the amount of family dysfunction that often occurs during the holidays. Although "The Guide," disparages "Nuit de Noel," I still found the description interesting, and I'd like to try it. I've heard a lot of people say that they enjoy it. Hear that, Luca and Tania?? I'M GOING ROGUE. I misread "ROGUE" as "ROUGE", and immediately visualized wearing vivid cream blush as a sign of civil disobedience. Ha ha! I LOVE Sensuous Noir (and totally think it could be in the Tom Ford super-fancy line-up and priced at $400 or whatever they cost) and now I will always think of Stupid Sweater Parties when I wear it. Thank you. For Marla's comment on your condition not making it to the DSM 5, (b/c there isn't yet a medication for sweaterthesia)- No fear-it's just a matter of time before the pharm R&Ds stumble upon this site and get cooking on the anti-venom...before long, the ads will be all over the television, complete with a young woman in sundress, frolicking through the fields of a dept store fragrance section- breaking free from the chains of her sweater-scent affliction as the narrator lists dozens of possible side effects - all much worse than the sweater visuals...But I love this disorder, too, and like Ines - I welcome more of it!! !Vive le disorder!! Can the young woman be riding a white horse - in slo-mo - through the dept store perfume section? Or is that only for tampon ads?